We’re excited to announce the release of WPForms 1.3.1! 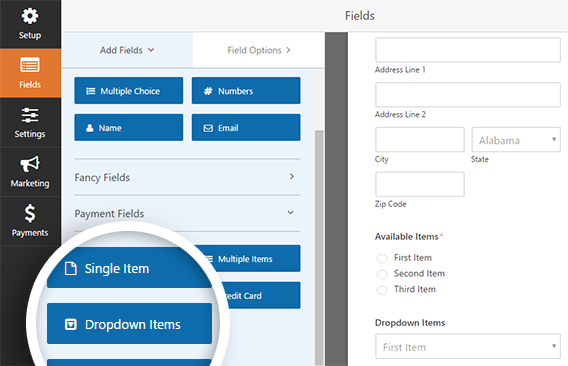 This version comes with several new features and enhancements, all requested by our customers to help save you save time and create better forms. Here’s what you need to know about WPForms 1.3.1. These smart tags refer to the author of the page or post that the form is on. Now you can customize your form notifications even more. Instead of creating a whole new form, you can tweak your notifications to notify the right person depending on which page it’s submitted from. To find out more about using smart tags to create more useful notifications, check out our post with 4 clever form hacks that unlock hidden customer data. You asked for it, and now it’s here! We added a new Dropdown Items payment field so you can create better order forms. You can find the new field under the Payment Fields section when editing your form. Ever wish you could keep the right people in the loop, without sending them a direct form notification? Now it’s easy, with our new Carbon Copy (CC) support for form notifications. Just navigate to WPForms » Settings to enable CC notifications. Check the box next to Email Carbon Copy. Then in the WPForms editor, you can go to Settings » Notifications. You’ll see a new CC field where you can enter an email address. Whenever a new user registers on your site using the User Registration addon, you and the user both get a notification about the new account creation. With WPForms 1.3.1, those emails can now use an HTML email template. Now you can keep your branding consistent across all your emails, giving a more professional impression to your new users. To find out more, you can check out this guide on adding a custom header to your email template. Also, new users no longer need to enter a username when registering. Instead, their email address is used as a fallback. In general, fewer forms fields means higher form conversions. Your users will find it much easier to fill out your shorter registration forms. That’s all for this update, but there’s always more in store. If you have any ideas or requests for new features, we’re always listening. Feel free to get in touch or leave a comment here. We want to thank you for all your support and feedback in making WPForms the best drag & drop WordPress form builder.